New trademarked chiropractic procedure helps hundreds relieve neck and back pain with help from a simple towel at Baywest Health & Rehab in Florida. The maneuver that we utilize is now trademarked, so if you see Manipuflex anywhere, it is a direct result of Baywest Health & Rehab. Ever since launching his own towel-assisted neck traction procedure on his patients in his New Port Richey pain relief and chiropractic clinic at Baywest Health & Rehab, Dr. Scott Coletti has helped hundreds of patients escape their pain and enjoy a new lease on life. Dubbed Manipuflex(TM), the procedure helps to open the joints of patients spines up to help pain relief. Once Dr Coletti's thorough orthopedic and neurological examination of the patient is concluded, including reviewing any X-Rays or MRI scans, he will determine when the procedure will take place. Depending on the patient's condition, it may be necessary to perform regular therapy and standard chiropractic treatment first to loosen muscles and joints up and get them into a state where their bodies can handle it. So while the procedure is very safe, the best care and preparation is always applied to the patient in order to obtain the best results. This procedure itself consists of strapping his patients onto his table, elevating their legs, gently wrapping a warm towel around the patient’s neck and (once the patient relaxes) delivering a quick but effective traction to the patient’s spine. The procedure helps disc injuries to decompress, freeing up any trapped nerves and helping to relieve pain by re-establishing proper spinal function and alignment. Dr. Coletti completes the procedure by manipulating the neck and assessing the patient’s condition post-Manipuflex(TM). While each case and patient is different, many experience the feeling of decompression and relief from their upper backs down to as far as their lower back. 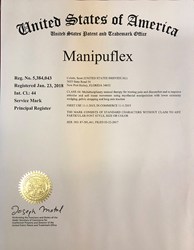 Since introducing his technique, he has registered the name, Manipuflex(TM) with the United States Patent and Trademark Office. The official confirmation came through in early February 2018. Dr. Coletti has applied the technique to many patients in his area and showcased the procedure on his YouTube channel. The technique has garnished many video views on his channel and also attracted attention from other YouTubers who have taken note of his Manipuflex(TM) highlights, embedding them into their own chiropractic “best of” videos. Most recently, thanks to his YouTube following, Dr. Coletti’s technique has created such interest that he has had patients flying down to his practice in Florida from as far away as New York and New Jersey to experience the technique and improve their overall function. Dr Scott Coletti DC is a doctor of chiropractic and has been practicing throughout the entire Tampa Bay area for over 18 years. His practice treats all kinds of joint pain, using techniques such as cold laser therapy and his newly trademark Manipuflex(TM) procedure. You can visit his main clinic website http://www.baywesthealth.com to learn more.